Robert Maynard Gurr was born on 21st October 1921 and entered Whangarei High School on 6th February 1933 in the Intermediate School as a member of Form IA. He entered Whangarei High School Senior School on 4th February 1935 as part of Form IIIA. A member of the School Shooting Team in 1936, 1937 and Captain in 1938. The Intermediate Swimming Champion in 1937 and the Senior Champion in 1939. A member of the Rugby 1st XV in 1937, 1938 and 1939, receiving colours for each of those years. Scholastically Bob passed School Certificate and University Entrance in 1938 and Higher Leaving Certificate in 1939. He also made the toast to The Masters at the School’s Annual Dinner in 1939, which was a real honour in those days. He left Whangarei Boys’ High School at the end of 1939 to attend Royal Military College Duntroon. After graduation from Duntroon in June 1942 Bob joined the New Zealand Army. During World War II he was Platoon Commander in 36 Battalion, 3rd New Zealand Division during 1943, Troop Commander in the Divisional Cavalry Regiment in Italy 1944/45 and finally served with the British Commonwealth Occupation Force in Japan during 1945/46. After the war, he attended the British Army Staff College at Camberley, was Officer in charge at the Tactics School in Waiouru and from 1959 to 1962 he went on to serve on the Directing Staff at Australian Army Staff College, Queenscliff. When the First Battalion New Zealand Regiment was posted on 9 Nov 1963 to the 28th Commonwealth Brigade Garrison located at Terendak near Malacca in Malaya, Bob was the Commanding Officer. He relinquished that appointment on posting back to New Zealand as part of the routine two-yearly roll over on 25 Nov 1965. 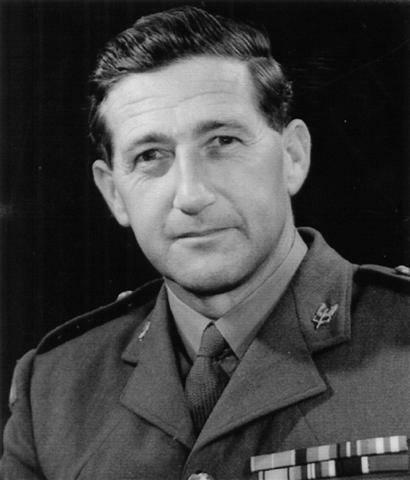 In 1969 Bob returned to Malaysia to take command of the 28th Commonwealth Brigade and oversaw the deployment of the brigade from Malaysia to Singapore having been promoted to the rank of Brigadier, the 3rd highest rank in the NZ Army. On 9th March 1973 he was posted to NZ Defence Liaison Staff, Canberra. Bob retired from the Army on 22nd October 1976. Along the way he was awarded an MBE for his services to the Military in 1956 and an OBE in 1966. He briefly took up a role with Broadlands Group before moving to Melbourne, Australia where he lived for the rest of his life. Sadly Bob died peacefully at his home on January 27th 2010. He has been described as a true soldier and an officer who led by example and earned the respect of those that served under him. His Command and Leadership abilities, and that of his fellow Officers and Senior NCOs, lead to the training that brought out the true qualities of the men that served under him in Malaya. He will forever be remembered by those men, and by anybody who had cause to fall under his guardianship.